It's probably bad form to admit this, but sometimes I spend an embarrassing amount of time trying to come up with things to write about. However, I'm always willing to embarrass myself for the sake of amusement and/or "edumakashun," as evidenced by my completely unhelpful Writing 101 series. So far we've covered The Process of writing, as well as the importance of using spell check to make sure you don't sound like a moron. 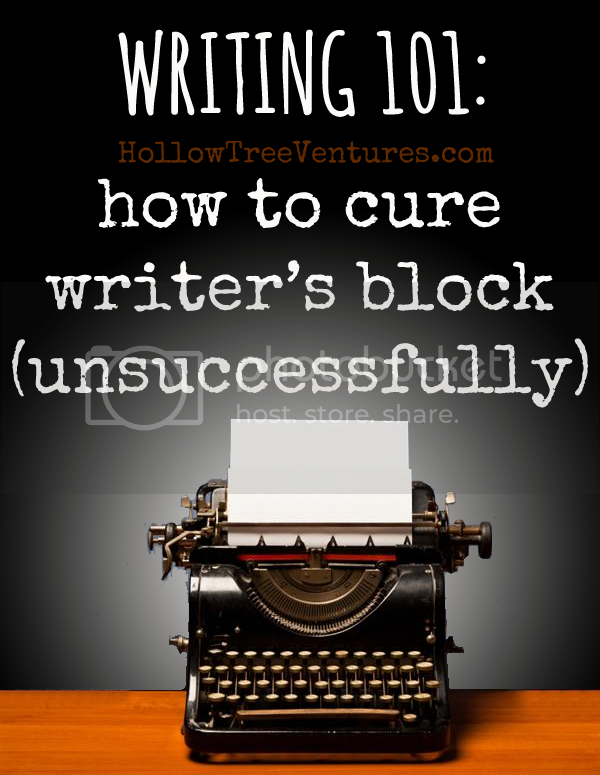 Now it's time to tackle writer's block. Unsuccessfully. Nothing makes a writer quite as insecure as writing. Or being asked to write. Or having writer's block, or thinking about writing, or even just waking up in the morning. Maybe that's because the hurdles to success begin before we even start, as we rack our brains for The Perfect Topic. Obviously when you're really all blocked up with writer's block, your list will make you want to give up writing completely and start guzzling Pop Tarts instead. That's when it helps to change things up a bit. For example, I don't have to rely on snark and hyperbole 1,000,000,000% of the time; I have a sensitive, thoughtful side deep down in there I'm pretty sure. So sometimes it helps get the words flowing to tap into the more positive, upbeat, and helpful side of myself, even if the strain causes me to bleed from the eyes a little bit. If I'm still suffering from Inspiration Deficiency when I get back from the walk-in clinic with my eye gauze, I refer to this list in hopes of igniting my creativity. However, I acknowledge that my list is a tad heavy on the bodily functions, which is neither indicative of my usual style, nor what I would consider creatively enabling for most people, especially if you find yourself short on babies at the moment. So, in case you don't want to write about dumb people, or about being dumb yourself, or dumb bodily functions, as I've suggested above (though I can't imagine why not), here are some things you can do to come up with some non-dumbness-based topics of your own. I have to admit, I'm totally drawing a blank here; this list would probably be easier to flesh out if I didn't currently have a raging case of writer's block myself. I'd love to tell you all about what else I do when I have a writing deadline looming and absolutely no idea what to write about, but this post is set to publish in the morning and I'm completely out of time. A version of this post originally appeared on Studio30Plus a couple years ago, but I'm republishing it here because... you know, writer's block. However, in case you haven't heard, I'm part of a blogging faculty that CAN help you - with writer's block, finding a tribe that'll help you through these rough patches, getting your writing to the next level (whatever you want that level to be) and a whole lot more. It's called BlogU, an affordable, accessible, intimate conference for writers being held in Baltimore in June! Check out the impressive faculty and peruse the class schedule with updated course descriptions. Tickets are on sale now - I can't wait to see you there!